Star Wars In the Shadows. On this special mini waffle on i talk about a fantastic new audio drama coming out soon called Star wars in The Shadows, it is written, directed and produced by Dany Pépin (37y/o) a French-Canadian born in Quebec, now living in Ottawa, Ontario. SWITS is Dany’s first original story of any type in his second language (English) and only second audio drama project following the surprising adaptation of Karen Traviss’ short story Omega Squad: Targets. Dany was mostly known in Star Wars fandom by his implication in the French community and his Star Wars radio show Star Wars en Direct, both in French (since 2001) and English (2003-2006). SWITS is a classic Star Wars space opera not unlike “A New Hope”. I would describe it as a light fugitive/adventure type of story with some mature theme inserted within. SWITS has obviously been inspired by the Star Wars movies but also its Expanded Universe (EU) like the media giant Shadows of the Empire and The Force Unleashed. There are many small EU references that will appeal to the fans of the genre, but most importantly the participation of Darth Vader, Emperor Palpatine, Xizor, Guri and Mon Mothma in the actual story plot. head to www.creativeaudioscape.com for more info. John Ryan. 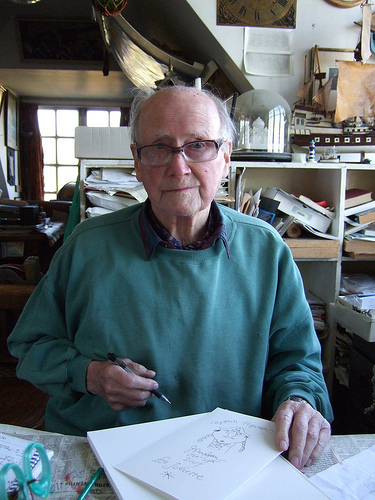 Cartoonist John Ryan, creator of the Captain Pugwash TV series, has died in hospital in Rye, East Sussex, aged 88. The BBC commissioned the first series in 1957 after spotting potential in Ryan's books about the tales of Pugwash and his nemesis Cut Throat Jake. His agent, Jane Gregory, said there was "a huge amount of love" for the childish pirate and his shipmates, who included Tom the Cabin Boy and Willy. Captain Horatio Pugwash was created in 1950 while Ryan was an art teacher at Harrow School, shortly after he got married to fellow artist Priscilla. It was published, in the same year, in the first edition of the Eagle comic. A book deal followed, before it was adapted for TV by the BBC in 1957, with black-and-white episodes being made until 1967. Colour episodes were shown on the BBC in a mid-1970s revival. Ms Gregory told BBC News he was "always enthusiastic, always charming". "A lot of the character of Captain Pugwash was John, which is probably why we loved him as much. We devote this mini waffle on to the memory of John Ryan.